When it comes to choosing the best electronic logging devices, it can be hard. There are so many great options to choose from. We hope that this Electronic Logging Devices Comparison guide will help you in making this important decision. All of the ELD devices described will help you comply with the ELD mandate. In addition to being compliant with FMCSA standards, having ELDs installed provide a number of additional benefits to your fleet. Here is a comparison of some of the most popular types of electronic logging devices on the market today. A company well known for its focus in GPS tracking, navigation, data recording, and data sharing technology, Garmin is at the lead of the pack when it comes to creating integrated, high quality ELD devices. 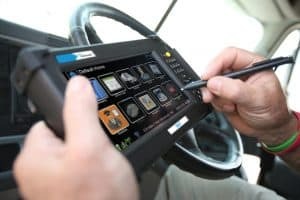 In the short run, Garmin will likely be more expensive, since the ELD comes fully loaded with all of the software, without need for extra fees or subscriptions. This eld unit is one of the most popular eld units. Furthermore, it provides a great eld option for owner operators. Most other truckers choose this as one of the best eld options. In the long run, the Garmin may pay for itself—and its many other premium features may be worth your while as well. The Garmin eLog™ will fit any standard 6 or 9 pin data port. Installation is simple, and it begins working as soon as you plug it in. Besides the eLog™ being compatible with a range of other Garmin devices, the proprietary software also allows you to connect your eLog™ system to a GPS enabled tablet or smartphone. The device is designed to last. The 2.5 oz. cylindrical device is in A case with a sleek black outer shell. The device data is accessible both from USB and through Bluetooth for quick sharing. The eLog™ also connects and can share driver data with a variety of Garmin GPS units from the dēzl™ series. This means that the driver can receive personalized updates and reminders for breaks and remaining time, all integrated as well through the smartphone/tablet app. The eLog™ costs about $249.99 through the Garmin website. While Garmin currently has only one model of ELD, there are several different Garmin GPS models compatible with the eLog™, each ranging in price from $299.99 to $499.99. This gives the Garmin a highly personalized experience, giving priority to driver ease with a friendly user-centered experience. The KeepTruckin ELD device to be one of the best on the market because it’s easy to use and affordable. This makes it perfect for a smaller fleet or one looking to save money while still being FMCSA-compliant. All you have to do to get started is connect the ELD device and download the free app for a smart phone or tablet. Its standard features include everything you need in an ELD device such as messaging, GPS locating, and basic HOS reporting. If you’re willing to pay more every month, then you can also access advanced DVIR reporting, IFTA reporting, and other advanced features that are being announced soon. As long as you don’t need these extra features, you can save money by sticking with their basic plan. The price of the KeepTruckin ELD device is by far its most appealing quality. There is no initial cost for the device or the installation which means you only have to pay their monthly subscription fee. This starts at $20 per month for their basic services. If you want access to their advanced services, then you’ll have to pay $30 per month, which is still a great price for FMCSA compliance. Some other features that this device has recently added includes fuel monitoring, engine diagnostics, idling reports, driver safety scorecards, geofencing, and tampering alerts. The addition of these features as well as the promise of more advanced features to come helps to set aside this device even further from the competition, even when you don’t consider the affordable price tag. This user-friendly, low-cost, and feature-rich ELD device is certainly one to keep on your shortlist. It was one of the first to reach FMCSA standards. It’s perfect for any sized fleet and can help your fleet save money. This ELD device is easily one of the best available today. They’ve set themselves apart by being affordable, providing sturdy hardware and easy-to-use, and having extremely accurate information. They’re not the most affordable option nor do they offer as many advanced features as other ELD devices. Still, they’re certainly worth looking into. What really sets EROAD Ehubo devices apart is that they weren’t just self-certified to meet the FMCSA standards of the ELD mandate. The went the extra mile by being certified by the transportation technology testing firm PIT Group. Since FMCSA doesn’t verify that the devices on their certification list are actually compliant, this provides all the extra assurances that a fleet owner needs to know that they’re choosing a FMCSA-compliant device. Another thing that sets this ELD device apart is that it can be installed even in older trucks. This is because it can be installed using the normal EMC connection or a 3-wire install. This is especially good news for fleets that have older vehicles that are still in service. They can be brought up to compliance and they can have their whole fleet on the same system. EROAD Ehubo’s many features include a daily recap of hours, log transmissions, maintenance tracking, flexible geofences, and safety event notifications for harsh braking, speeding, etc. Because it was originally developed for fuel tax tracking, it’s one of the best for IFTA reporting. Some upcoming features include engine diagnostics, GPS tracking, and more. Which features you want will determine the monthly cost of this device. It only costs $100 in initial costs for an activation fee and a cable. The lowest level plan is $35 per month and only provides ELD capabilities. Next is the TotalTax plan which has a few more features and is $45 per month. Then comes the highest-level plan with all the features for $60 per month. All-in-all, you can’t go wrong with the EROAD Ehubo ELD device. It has everything you could ask for in an ELD device and is one of the most affordable setups on the market. Not only that, but the technical support you receive with any monthly plan is outstanding so you’re never more than a phone call away from having any questions answered. If you’re looking for an unbeatable ELD device in terms of reliability, durability, and features, you can’t get anything better than the PeopleNet Display.4. What holds most people back from this ELD device is its high price and lengthy installation process. However, if you can afford it, it’s worth it. In addition to being such a great device, the PeopleNet Display.4 has a simple, user-friendly interface. That makes it easy for drivers to learn and utilize. They are known for being one of the longest-standing companies in the electronic-logging business and for having outstanding customer service. What also sets them apart is that this device supports 4G LTE cellular communication. A few of the many features included in the PeopleNet Display.4 include: real-time safety alerts, fault codes, tire pressure monitoring, fuel consumption reports, and engine status monitoring. Some of the more advanced features that are hard to find in other devices include integrated multi-directional cameras, ALK CoPilot navigation, and others. Because of the number of features that are included and the high quality of the equipment itself, there’s a high cost that comes with choosing this ELD device and provider. The initial price for the hardware and installation is $1200 per truck, one of the highest in the industry. From there, you’ll be paying $43 every month for their service plan. If you want the best device with the most features, then PeopleNet Display.4 is the way to go. Of course the price is a hard pill for many fleet owners to swallow. Large fleets that have used this system agree that it’s the only way to go if you value quality in an ELD device. Are you looking for the cheapest option when it comes to reaching FMCSA compliance? It doesn’t get cheaper than Blue Ink’s BIT ELD. They only charge you for the device and installation. After that, there are no monthly fees, allowing you to save more money the longer you use their devices. This option is particularly appealing to smaller fleets and independent drivers. One of the things that makes Blue Ink’s BIT ELD so inexpensive even with the initial costs is that it’s a Bring Your Own Device (BYOD) option. That means that you will need to provide your drivers with a smart phone or tablet. Alternatively, they could use their own if they have one. This does usually mean paying monthly for a data plan to keep the smart device connected to the ELD device. Installation is incredibly easy. All you need to do is plug the device into the diagnostic port of the vehicle. Then, download the app to connect the device to a smart phone or tablet to get started. This makes it one of the fastest and easy installs of all the available ELD devices. Unfortunately, it can also mean that if the Bluetooth connection is lost, data may also be lost. The BIT ELD will help your fleet be FMCSA-compliant, but it won’t do much else for you, which is why it’s favored by smaller fleets that aren’t worried as much about the extra features that you can get with other devices. The features that are included are: HOS recording, a built-in DVIR, IFTA reporting, and maintenance scheduling. Some upcoming features include TMS integration, two-way messaging, and engine diagnostics. Overall, the Blue Ink BIT ELD can’t be beat in terms of price. Although it lacks many of the advanced features of other devices, what it does do, it does well. This makes it the perfect fit for owner-operators that want to be FMCSA-compliant but can’t afford an expensive device. The Intelligent Vehicle Gateway (IVG) is the flagship device for Omnitracs. It’s packed with features that make it an easy choice for any fleet. 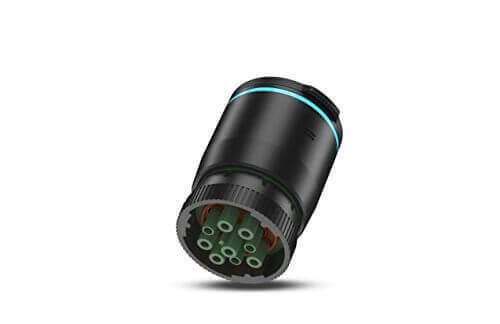 This device is marketed as a “one device, one cable” solution for fleets. Standard features include: DVIR, logs, messaging, engine diagnostics, and navigation. Some advanced features that the high-end models include are: tire pressure monitoring, in-cab scanning, and dash cams. The IVG also has a voice command system so drivers can access the device without needing to touch it, and smart phone compatibility. In the future, it can be used as a wi-fi hotspot. The installation process is simple and should only take around 30 minutes. Although it is a more complicated install compared to some of the other ELD devices on the market, it is much simpler compared to many others. Some of the dash panels will have to be removed so a back-plate can be installed for the screen mount. Then, the device is connected with the diagnostics port. As far as price is concerned, the IVG is one of the most affordable options on the market, especially for everything you’re getting out of it. The initial cost for the device itself is between $750 and $800, which is more than some ELD devices. But it’s also significantly less than devices that offer the same features. Since the basic monthly plan is only $30, this device beats out a number of other providers in the long run. Overall, this is yet another excellent product in the Omnitracs line that proves why this company is a leader in the industry. It goes way beyond providing basic FMCSA compliance to bring fleets innovative features, an easy installation, and reliable service. And it all comes for an affordable price. If you’re not already considering this ELD device, you should be. When considering the cost that goes into an ELD device, you have to factor in more than the initial costs. These include the cost of the device itself and installation. You also have to think beyond the monthly service fee. If a device requires a Bluetooth connection with a smart phone or tablet, for example, you can expect to pay at least $15 per month for a data plan in addition to the monthly service fees. Something else to consider is the long-term cost. Some of these devices appear to have a higher cost because the initial installation is more. However, if they have a lower monthly cost, they can end up being more cost-effective in the long run. The best way to figure out the average amount that you will actually spend per month is to spread out the initial cost over 3 years. Some ELD providers expect you to sign up for a contract. This is something else you need to think about. Signing up for a 2- to 3-year contract means being locked into a certain price for a long time. Some providers that don’t charge initial installation costs do so because you have to sign up for a 2- or 3-year contract. Then, part of their monthly fees covers their costs for the device. Signing up for a long-term contract can be a good option if you are sure that you have found the right ELD provider for you. But, this can be a problem if you find that you don’t like the device or the service. There are some devices that will allow you to have a free or paid trial period. Then, you can try out their products and services to see how you like them. This is great if you’ve taken the time to decide which electronic logging device is right for you but aren’t completely sure it will actually work for your fleet.